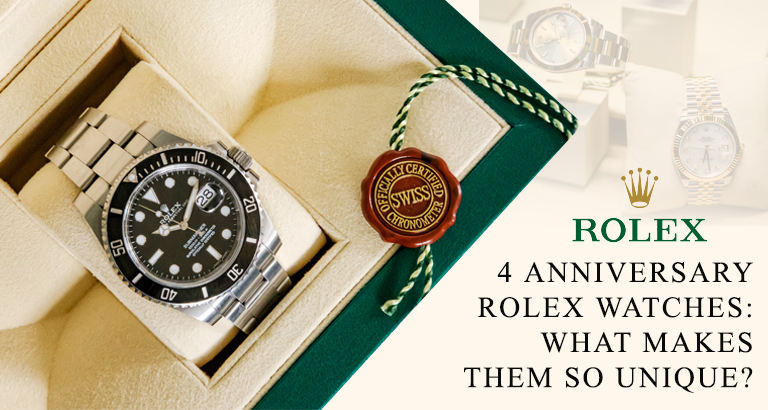 Watch brands like Rolex love to celebrate anniversaries. Unlike other watch brands, Rolex does not manufacture limited-edition watch models and also, does not usually pair up with noteworthy people for making collaborative editions. However, the only exception to it was the Rolex Deepsea model with D-Blue dial that the brand produced as a tribute to James Cameron’s dive to the deepest point of our world. Rolex anniversary watches and discover what makes them so unique. With the launch of the Rolex Cosmograph Daytona in 1963, a new era for Rolex watches came into light and today, Rolex Daytona is ideally the most popular luxury watch ever known. Rolex introduced an updated version of the watch in 2013– Reference 116506 for celebrating the 50th anniversary of the Cosmograph Daytona. The anniversary Rolex Cosmograph Daytona features an Oyster bracelet in platinum, Oyster case of 40mm and also, a ceramic bezel. Although this watch was the second Daytona to exhibit a ceramic bezel, it was the first time that Rolex Daytona appeared in 950 platinum. The cherry on the top, however, is the ice-blue dial that contrasts exquisitely with the brown ceramic bezel and coloured sub-dial chapter rings. Debuted in 1971, Rolex Explorer II was especially designed for those who venture into Polar Regions and dark caves. The watch sports the stationary 24-hour marked bezel and additional 24-hour hand that enable wearers to differentiate between day and night hours. The Rolex Explorer II Ref. 216570 was introduced to celebrate its 40th anniversary in 2011. The ref. 216570 features a more massive 42mm oyster case, bolder fonts on the 24-hour bezel and ‘maxi’ style dial. The very first Rolex GMT-Master was launched officially in 1955, specifically designed for the Pan Am pilots to help them track two time zones simultaneously. After five decades, Rolex introduced the anniversary edition Rolex GMT-Master II in yellow gold to celebrate the 50th anniversary of the watch. The anniversary GMT-Master II reference 116718 features a green dial, 40mm ‘super’ case, larger hour markers and hands in the ‘maxi’ style dial and also, the new ceramic bezel. This entirely refurbished model consists of many other design elements that could set the standard for the upcoming Rolex sports models. The Rolex Submariner made its debut as the first diving watch of the world in 1953 that was water-resistance up to 100m. While the watch became the most sought-after diver’s watch, the stainless steel Rolex Submariner ref.16610LV was introduced to commemorate the Submariner’s 50th anniversary in 2003. The watch features a 40mm Oyster case with matching Oyster bracelet, ‘maxi’ black dial, Mercedes-style hands, luminescent hour markers and the all-new green bezel. The Rolex Submariner reference 16610LV was nicknamed as ‘Kermit’ because of the unidirectional rotating bezel’s vibrant green colour. The Geneva-based Swiss manufacturer-Rolex undoubtedly knows how to commemorate a milestone anniversary in utmost luxury and style. Are you looking to sell your Rolex watch in London? 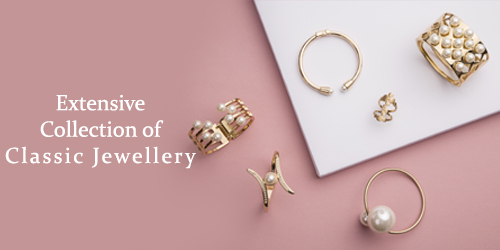 If you are looking to ‘sell my Rolex watch’, or ‘sell Rolex watches’ in London, begin the process by filling up our online form and get an initial quote right away. 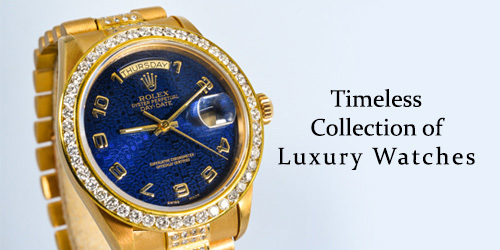 The Luxury Hut offers a quick and secure way to sell Rolex watches for cash. Whether you sell your Rolex watch in London via appointment or from anywhere in the UK online from the comfort of your home, we will make the process of selling convenient and straightforward. Simply, fill up our online form, and one of our associates will get in touch with you soon with an initial price quote. Or, you can call us on 0207 242 5411 and arrange an appointment to visit us at our Hatton Garden office in London with your luxury watch. We will assess every aspect of your Rolex watch, considering all the necessary details that may add value and then determine the final price that we at The Luxury Hut are willing to offer for your watch. Accept our offer, and we will pay you immediately.